Summer is a great season but it can also be a dangerous one. There are plenty of dangers that we may not even think of regularly when it comes to our dogs. 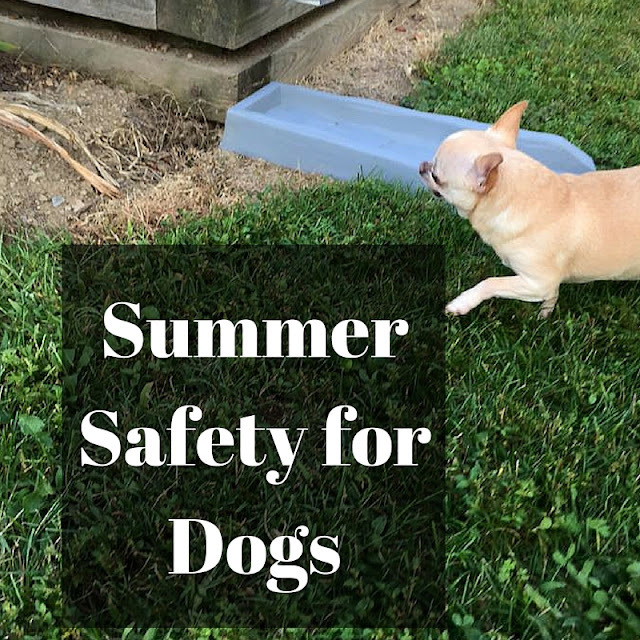 So I put together a few tips and reminders to keep you and your dog happy and safe this Summer! Water should ALWAYS be accessible to your dog when he or she is outside. Dehydration is a serious thing and however hot it feels to you outside, it's even hotter for your dog. Just think of all that fur! Anytime you travel in the car you should always have your dog container whether it's in a car seat, car harness, or the backseat with a divider that prevents your dog from coming into the front. Not only can your dog be a distraction, but he could even cause a traffic accident. Also, never leave your dog in the car unless you have the A/C running. Fireworks scare Stella and Rocky. I know many of us have dogs that get startled by firework celebrations so make sure you have a good distraction to help keep your doggy calm. Chewy has these great True Chews which are not only made in the USA and delicious but they are a great way to keep a dog focused on THEM and not the sounds outside. They are made with real meat and have no corn, wheat, or soy. Never let your pet outside without a collar or leash. Even if you have an electric fence, things can happen and if your dog escapes, you want to make sure he can be easily identified and returned to you so be sure his collar has an updated contact number on the ID tag! Also, always keep your dog securely on a leash when outside. Not only to keep him safe from cars, but also to keep him under control when other people or dogs are around. Backyards are full of all sorts of plants and edibles. If you have a veggie garden or a flower garden, make sure your dog is not able to get into it. Some flowers and foods can be poisonous to pets. Also, be mindful of mushrooms as some can be poisonous to pets. If your dog ingests ANYTHING you are unsure of, call your vet immediately! Another reason to despise bugs.... they can sting and bite your dog! Always keep an eye on your dog when he's outside and if you see him checking anything out, make sure you know what it is. Bees can sting, spiders can bite, and you never know what could go wrong. What tips do you have for summer safety? These are some really great summer pet safety tips! It's definitely good to be aware of how your pets are feeling during the heat. We also use cooling mats and icy bandannas to keep our dog cool! Thanks for sharing these great tips. Have a great week. Wow, this is really an amazing post for my dear guys, nice writing! Garden Progress | I Made All Deez! So You're Broke + Bored This Summer....Now What?